22.03.1974, 400 Ordinary Shares of 12,5 Pence, #44048, 20,3 x 25,5 cm, schwarz, türkis, Knickfalten, sonst EF. 22 March 1974, 400 Ordinary Shares of 12.5 Pence, #44048, 20.3 x 25.5 cm, black, turquoise, folds, otherwise EF. Die Gesellschaft wurde 1896 als Central Province Prospecting Syndicate in der Region von Maharashtra und Madhya Pradesh gegründet. 1935 firmierte sie in Central Provinces Manganese Ore Company Limited um. 1962 übernahm dann die indische Regierung die Minenaktivitäten von der Gesellschaft. Es kam zur Gründung der Manganese Ore (India) Limited, kurz MOIL. 51 Prozent der Anteile wurden von der Indischen Regierung und der Regierung der Region Maharashtra und Madhya Pradesh gehalten. Die anderen 49 Prozent waren im Besitz der Central Provinces Manganese Ore Company Limited. 1977 wurden die verbleibenden 49 Prozent von der Central Provinces Manganese Ore Company Limited erworben und MOIL befand sich fortan komplett im Staatsbesitz. The company was incorporated as Central Province Prospecting Syndicate in the region of Maharashtra and Madhya Pradesh in 1896. 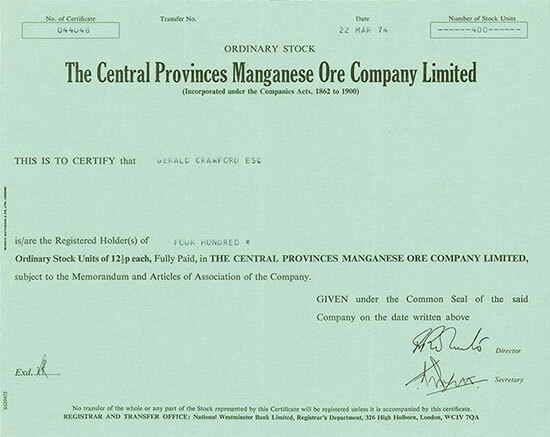 It was later renamed as "Central Provinces Manganese Ore Company Limited" in 1935. In 1962, the Government of India took over the mining activities from the company. Then, Manganese Ore (India) Limited (MOIL) was formed with 51% stake held between the Government of India and the Maharashtra and Madhya Pradesh State governments. The other 49% were retained with Central Provinces Manganese Ore Company Limited. In 1977, the balance of 49% was acquired from Central Provinces Manganese Ore Company Limited, and MOIL became a 100% state-owned enterprise.